I loved how thought out the characters were. They became real on the pages. The love Ren feels for her twin brother goes above and beyond. It made me ask how far I would go for one of my siblings, and would I know when enough was enough? I really liked that the romance/crush wasn’t over done in this book. I hate mushy romances, always have. We didn’t find what is found in so many stories, instant love. Instead the author let feelings develop slowly and naturally. The creation of all of the magical creatures shows how well developed the author’s imagination is. That for me is a big plus. 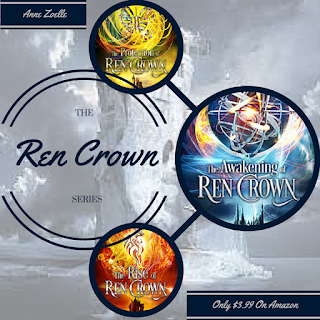 The title was the best at describing what happened to Ren, her magic awakens. Awesome characters, great world building, make this a series to be read. Come back tomorrow for the second book in the series, The Protection of Ren Crown and then Saturday for the final book in the series, The Rise of Ren Crown.